I just wanted to tell you that we did indeed get the blanket from EBAY. It arrived tonight. Once again, thank you so very much for your help. It is greatly appreciated. 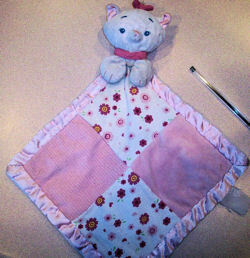 I’m looking for an Aristocats Marie white kitty blankie with pink and flower print squares. My 20 month old daughter received this Marie Cat blankie when she was 4 months old as a gift. At the time, she wasn’t attached to any particular lovey, so it was one of about four different loveys she would sleep with. About six months ago, it was clear she preferred the Marie Cat blankie, and now she won’t sleep with anything else. We’ve substituted Marie Cat plush dolls without success. We are trying to find a back up, since it’s gone through a lot. Thank you for all your help. It’s greatly appreciated. Hi, I think the blanket you are looking for is on E-BAY for a buy it now of $34.99 iteam #150579612373 Hope this helps. That’s it, Lana! I’ve notified the mailing list.